Currencies are fairly flat and EUR is trading around 1.1340 and JPY at 110.60. Markets await an indication of the direction of the US-China talks. Trump commented that progress is being made in the talks and given that this week (March 1st ) is the deadline for the next round of tariffs, markets expect an extension of the same on the back of these positive comments. Oil continues to be buoyant due to these deal hopes, with Brent trading above 67.00, after being as high as 67.70 on Friday. Fed dovishness continues in the comments from most Fed speakers, and this week’s testimony by Powell to the US Congress would be keenly watched for further confirmation of the dovish stance. But as the China deal seems to be a possibility, it would be interesting to hear his comments on any effect on US growth and markets. Data-wise, this week would have the US GDP which is expected to print below 2%. If China deal gets done, the possibility of a sharp jump in US GDP next quarter cannot be ruled out. For now, a stable behaviour in INR continues to be the norm one can expect this to be the case over this week also unless the trade talk news flips completely. Thanks to Trump, INR seems to be in a better place than yesterday, as Crude is down sharply after his comments that oil prices are getting too high and asking OPEC to relax. Brent is trading at 65.20 after being as high as 67.50. It seems Trump understands that oil price jump is a primary risk of a deal with China, and wants to nudge Saudi Arabia to loosen up their production a bit. The Dollar is mildly weak against EUR, at 1.1360. USDJPY is trading higher at 111.00 ahead of Powell’s testimony. He would testify before the US Senate banking committee and the market would parse his comments for clues on how the Fed is looking at the balance sheet reduction plans. While most investors expect that the language on rate hikes would stress ‘patience’, the critical aspect remains whether the Fed would end the balance sheet reduction this year. Trump officially extended the March 1st deadline for tariff increases citing good progress in talks with China. While this is expected, we are still sceptical on how exactly would the contours of the deal shape up. If China does agree to buy huge quantities of agri-commodities from the US and also agree to keep Yuan from significant depreciation, we wonder how successful they would be in adhering to these terms. It is not so straightforward to just substitute large import quantity from one country to another given the international trade regulations. Further, once they start importing more from the US, large current account deficit coupled with high CNY domestic liquidity makes it hard for them to keep CNY from large depreciation. The short term augurs well for CNY and risk currencies, including the Rupee, but medium-term risks increase with such a deal. For now, there could be some appreciating bias in INR as oil also has now a sort of a cap with Trump comments. But the overall range of 70.25-71.75 is intact for now. Indian attacks on the terror camps inside Pakistan led to a jump of 30 paise in USDINR, but INR recouped the loss soon. Given that the IAF actually crossed over inside Pakistan air space to attack the terror hub, this is a serious incursion from the Pakistan perspective. The geopolitical risk of further escalation could keep INR under some pressure in spite of a benign global environment. The Dollar is mildly down after Powell’s testimony. He reiterated the ‘patient’ stance and also said that the FOMC is looking at plans of ending the balance sheet run-off. EUR is trading at 1.1380 and USDJPY is at 110.60. GBP is higher as the British PM offered that in case her deal is not agreeable on March 12th, there would be a vote on a no-deal Brexit or an extension of the March 29thdeadline. GBP is trading at 1.3250. Brent is mildly up, at 65.70 level. While most global factors are positive for the Rupee in the short term, geopolitical tensions would keep it from strong appreciation. India-Pakistan tensions are keeping the Rupee under pressure, even as global factors continue to be fairly benign. Overnight, USD is mildly strong, with EUR trading at 1.1380 and USDJPY at 110.90. Crude prices are higher in spite of some negative comments on the China deal by a US official. Brent jumped after EIA inventory release and a statement from Saudi Arabia that they could extend OPEC cuts and is now trading at 66.50. 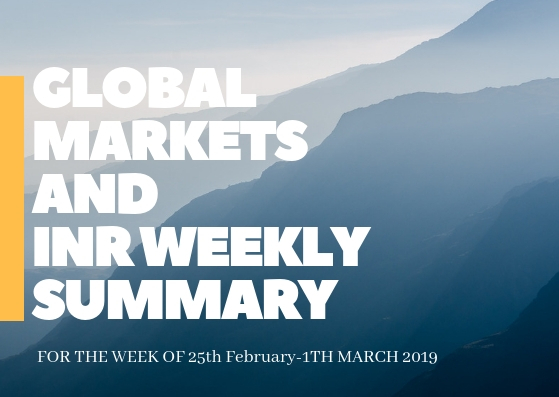 Markets are nervous around the escalation of the India – Pakistan conflict, which can pose a near term threat to both equity markets and the Rupee. Powell’s testimony to the US Congress did not throw up any major surprises. China deal hopes waned a bit after comments by the US negotiator that there is still a lot of ground to be made to reach an agreement. For now, the short term outlook is volatile as long the tensions on the border continue, but the broad Rupee range is still intact. Indo-Pak tensions eased yesterday after Pakistan announced that they would return the IAF pilot to India today, and that news led to a sharp appreciation in INR to close around 70.72. The Indian response to the news suggests that India views this as just Pakistan conforming to the Geneva Convention rather than any peace gesture. Further, comments from Modi in a speech at a scientific awards ceremony that they just finished a ‘pilot project’ and the real one is coming up, suggests that there is more to go in this conflict. We continue to believe that INR would be under pressure till there is clarity that the skirmish is coming to end. India GDP for the December 2018 quarter came in at 6.6%, slowest in 5 quarters. The FY19 estimate also fell to 7% from the earlier 7.2%. This data would influence the RBI to go for more rate hikes in the coming meetings. The Dollar is fairly flat against the EUR (1.1375) but is stronger against JPY (111.60) on the back of a better-than-expected US Q4 GDP which printed at 2.6%. US yields are higher post the GDP data, and the 10y is above 2.7%. Crude is fairly flat at 66.50 level on Brent. Volatility and news-based moves in INR can be the norm for the next few days till there is a possible end to the border tensions. But the broader range is still intact and there is no sense of a decisive direction in the currency yet.